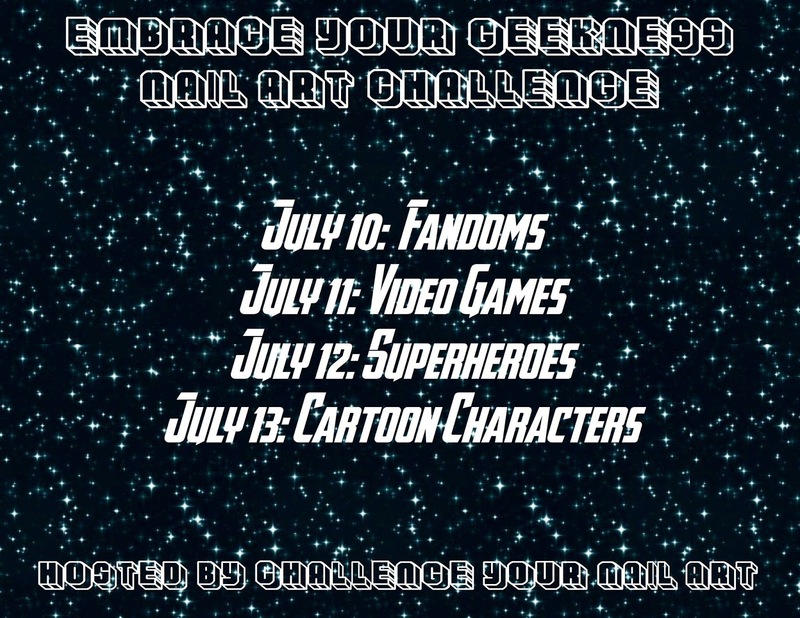 Today is the start of a new challenge with Challenge Your Nail Art! Our theme this month is Embrace Your Geekness. I was really excited about this theme but I am also suddenly really busy so to be honest until this morning I was planning on skipping this month. Then I started thinking as I was laying in bed "Well... I was really excited about my Hobbit idea... I could probably get up now and throw it together before work... Couldn't I?" And so here we are! 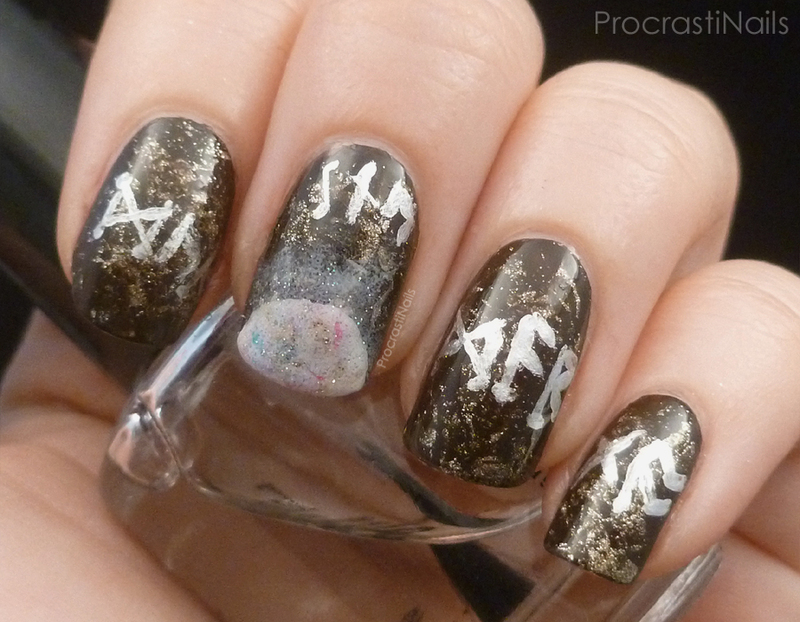 My top fandom at the moment is The Hobbit, and I think this design expresses a wee fraction of my true geekness. Check under the cut for more info about what exactly you're looking at, haha. Not my best in terms of execution, but I still think this is a great idea. And now I'm sitting here trying to think of a way to explain all the components without coming off as a complete nerd... But I guess that's the point of this challenge, right? Embrace it!! Basically the background is the earth with veins of gold (via saran wrap) twisting through them and then my interpretation of the Arkenstone on my accent nail. Then I used some Dwarven Runes (they're technically supposed to be moon letters because I wrote them in silver) to spell some things out along the top. (Don't try too hard to read them if you know runes, I was spelling things but then the "Y" looked to hard so I defaulted to random letters. "Durin" is in there though.) 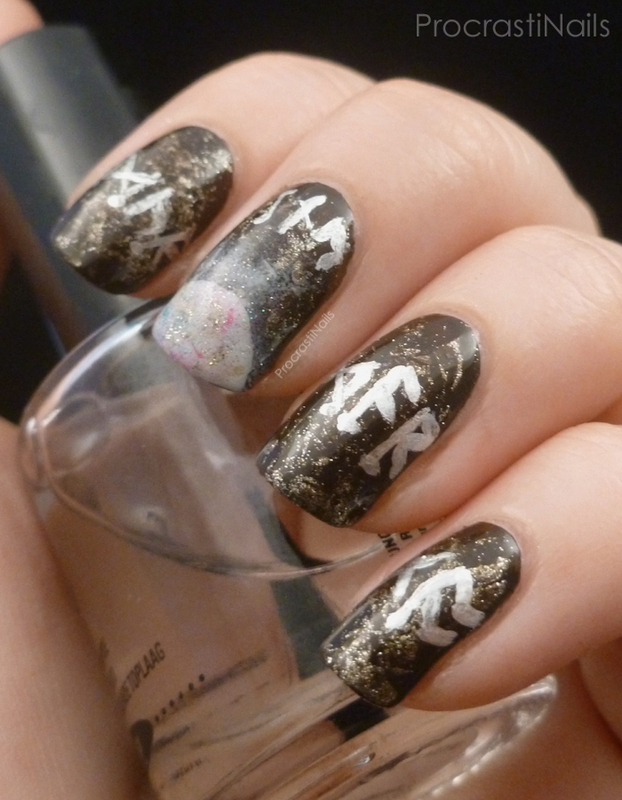 Basically it's a very dwarven manicure, and wow those are words I never thought I would string together! So that's it for my rush job for today. I'm off tomorrow so hopefully the next one will be better! Its interesting but I like it. I'm glad you explained it, but once you did, I totally saw what you were going for! Awesome! I needed the explanation too but once I got it then I "got it." Beautiful work!